France and Britain, having engaged in rivaling relationship for centuries, have near-identical levels of national wealth, population, and historical swagger. But when it comes to food…. The French raised cuisine to a high art, while Britain- just across the channel, has had such a poor reputation for food until recently. French cuisine may be my all-time favorite. But I always turn to British comfort food when I have a rough day at work… scotch eggs, bangers and mash, sticky toffee pudding and the list goes on. Heartwarming, filling and satisfying, they are always there ready to give me a cuddle when I need it most. 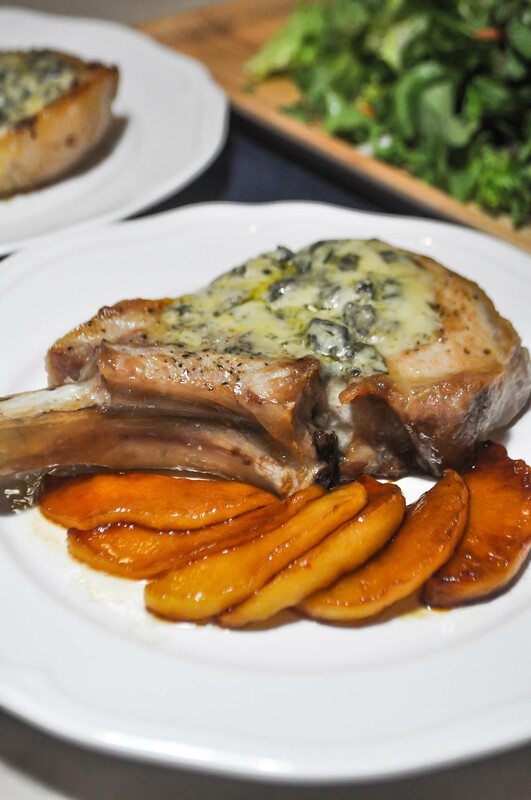 Stilton pork melts – a classic British delight, can also be made with any kind of blue cheese on top of pork chop with a spread of Apple sauce in between. Here I replaced the apple sauce with caramelized apples, using the leftover apples I had from making chicken Normandy. 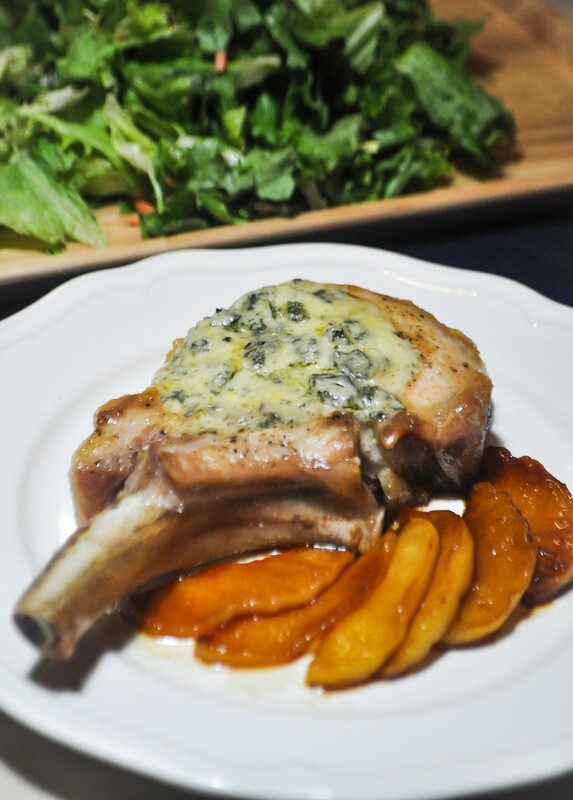 The blue cheese adds a mellow depth of tangy flavor and sophistication to the dish. It brings together the tender pork and the sweet, sticky apple pieces, fusing them to create an incredible depth of flavour. Season the chops on both sides with a good sprinkling of garlic salt and pepper. Heat oil over medium heat in a saucepan, cook pork chops on both sides until they are golden brown, 2 to 3 minutes on each side. Start preparing for the caramelised apples for the time being. Peel and core apples. Slice into 1/4″ wedges. Melt butter and sugar over low-medium heat until sugar dissolves and mixture is bubbly, about 1 minute. Add apples and cinnamon and cook over medium heat until soft and tender, for approximately 10 minutes, stirring constantly. Spread a generous layer of stilton cheese on each chop, return to the oven to cook for further 5 minutes, or until the cheese melts. Transfer the cooked pork chops and caramelised apples to a plate, let the chops rest for at least 5 minutes before serving.